So as many of you know I spent last week on the other side of the world in El Salvador and Costa Rica. Most (nearly all) of the time was spent on farms, and there is lots of info on all that to come soon, but one afternoon was spent in a training room in El Salvador. 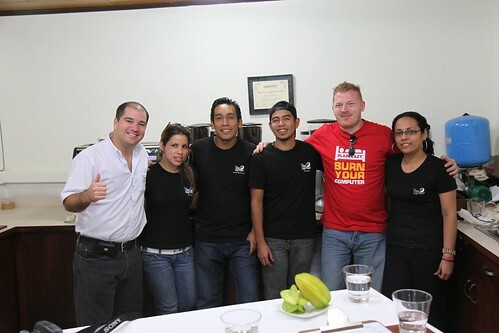 The training room was that of viva Espresso, an independent group of shops in San Salvador doing amazing work. I first found their shop on my trip in 2007 and their wonderful owner Frederico Bolaños, and was blown away with the shop. I also got to meet Lili Pacas, who was the champion who would go to Copenhagen for the World Barista Championships in 2008. Since then I have had fond memories of the shop and the team there. I have since kept a close eye on their exploits and they have held the national title ever since. In London last year I got to meet Frederico and the 2010 champion Alejandro Mendez who I really liked. He was super charming and super talented, and one of the true highlights of the competition for me was meeting these two. Because of the wonderful internet, I’ve exchanged tweets and emails with Frederico and it’s great to have friends over the ocean. So on the Tuesday I was invited to a run through of the three competitors from the shop, for feedback advice and to help them run through the performance. So the three were Daniel Méndez, Flor de María Góchez (2009 el Salvador Champ and finished 9th in the world championships in Atlanta) and Alejandro Méndez (2010 El Salvador Champion and has made the semis of the world championships finishing 11th overall). The performances were amazing, like truly amazing. I didn’t have to say this, but I felt all three could have competed on a very high stage, with the sig drinks being amazing. But there was another reason to be there. Because of meeting Alejandro in London, he asked if I could roast the coffee for him for his national competition. Not because of anything we can do better than them (the quality of roast from both the other guys was amazing) but to show the international reach of great El Salvador, and how coffee has brought new friends to know of what they are doing in San Salvador. Honoured to be asked to help, I took the coffee in my luggage (we sent some out earlier to make sure he was happy with fedex) and with a blend of Coffees from La Iluison, Alejandro only went and won! So off to Bogata in the World Barista Championships in June. So proud of the guys asking us to be involved and so pleased that I decided to roast for competition again this year, I would have been gutted to miss out on the feeling I got when I heard that Alejandro had won, that’s very special. Also because of competition I’ve got to make great friends like Frederico.